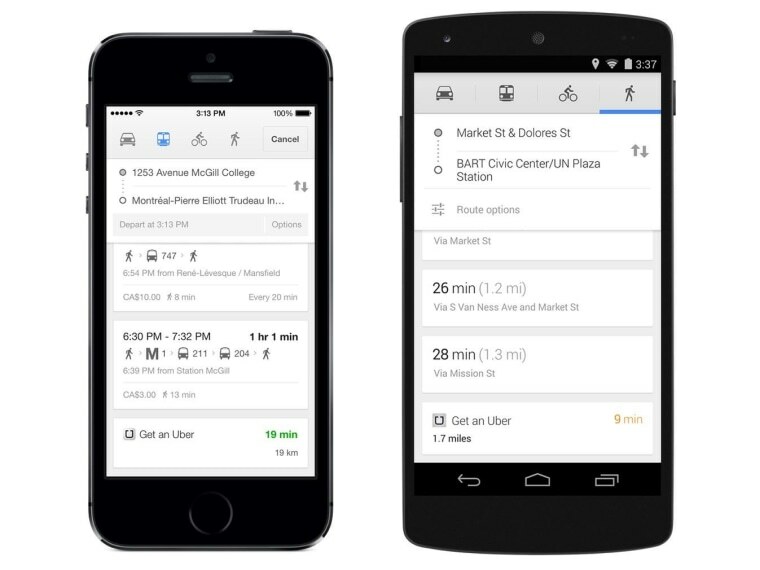 The latest version of Google Maps for iOS and Android comes with a few nice new features, among which is the ability to check for nearby Uber cars and request one with a tap. But what about those other car-sharing services? The update, announced on Google's Lat Long blog, adds lane guidance to turn-by-turn navigation, easier offline maps, and filtering of nearby locations by price, rating and other measures. But the Uber integration is what has people talking. It's convenient for people who use the private car service, of course, but the natural question is: Why not allow the user to launch Lyft, or call a taxi, or check for a Car2Go in the area? The fact that Google Ventures has invested $258 million in Uber lays the company open to some unsavory speculation. But to be fair, Uber is also by far the most well-established smartphone-based private car service, and it should come as no surprise that it would be working with the likes of Google to be a part of location-based searches. NBC News contacted Google for clarification on the issue, but the company declined to comment further than saying "We don’t have any more news to share at this time about future integrations." You can download the update now for free by going to the App Store or Google Play Store.